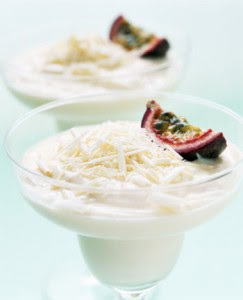 This white chocolate mousse recipe is the easiest I have found and has the fewest ingredients. 6 x Squares Baker's White Choc. Melt Chocolate. In a large mixing bowl, beat egg yolks until light in color. Blend in chocolate. Dissolve gelatin in hot water, then gently whisk into chocolate mixture. Chill until mixture mounds slightly. Fold whipped cream into chocolate mixture, and whisk just until combined. Pour into dessert glasses. Chill at least 2 hours.